I suspect you are a mobile addict. You don’t have to be obsessed and have the device in arms reach at every moment to qualify. You merely have to rely on its always connected capabilities to keep you “plugged” in to your connections, and by default the world. The speed at which mobile technologies have been adopted has been unprecedented, and I am less interested in its occurrence, and more interested in unraveling its meaning and understanding what changes will unfold next. This post invites you to consciously evaluate the range of activities that tether you to this device, and the choices you can make next. An overwhelming number of people check their device for “messages” within their first waking moments. In the not-too-distant past, messages waited to be picked up in the variety of places where they were left. A missed caller could leave messages on answering systems, that replaced secretaries who made and pass a note. This task was automated by machines who accurately recorded the caller, and refrained from edits or shorthands. The machines soon became embedded into answering systems with retrieval now possible remotely. You could call in to learn who had called. Email, a desktop computer application, was faster than the post office, and quickly displaced the fax machines for sharing documents or lengthier detailed messages. Cheaper computing, networks expanded Email from an office communications system to personal. Not only was it faster than regular mail, it was significantly cheaper than calling and more convenient. Now, all messaging systems are neatly available in your single mobile device, and your messaging interests and practices routine, if not obsessive. How does this capability to be more on top of your communications make you feel? Does this combination of access make you feel more effective, responsible, efficient or something else? Are the experiences and emotions associated with interaction or the anticipation of the interaction? when and why does the experience become distracting or chaotic? I’m asking this questions, because I have a hypothesis that needs testing. I believe it’s the small stuff we change that leads us astray from our original purpose or focused intent. Distractions come in many forms and largely occur when our attention wanders. Driving for example, our focus should be on the road, the vehicles and conditions. Instead , we’re typically multitasking while driving, Whether the division of our attention happens by listening to the radio, engaging in conversation with a passenger, or on the phone , or just the flow of other thoughts. Diversion is candy to the brain. It’s how small stuff easily adds up. The sideways glance that misses what’s ahead robs our attention, scatters our focus, can delay our progress and mar our effectiveness. Any efficiency we built in to our process are quickly filled by the abundance of new opportunities, the change in process enables. Here’s the rub, it’s at the moment of learned efficiency that we choose either to keep learning or we move on to a new domain. In both cases, we have reached a level of effectiveness and masters keep moving up while the rest of us begin a steady ascent of decline. This has been documented as the learning curve aka the efficiency curve, and it’s that pivot moment that interest me. My hypothesis is that it’s in those moments of awareness of the pivot point that innovation begins. I invite you to consider the value of anticipation, or the expected emotions that flow in a particular situation. For example, we want a celebration event to end on a happy note. Likewise we want our decisions to also produce positive outcomes, but that’s the problem, not all of our behaviors result from conscious decisions. When driven by habit, the small stuff that changes escapes our notice. That’s both good and bad. For example, no matter where you live on the planet, the time of sunrise and sunset changes daily and we generally don’t notice or feel those effects. We do experience the differences relatively over long periods of time, such as the longer days of one season vs. shorter days in another. The same is true over the little changes we make every day in the use of our mobile device. Perhaps you have grown aware that you are using it differently than you did a year ago, but you don’t know exactly why or what you are doing differently. Of course some of the changes have been controlled by the businesses who are using agile methodologies to constantly release improvements in the look, speed and functions available on the screen. The more these businesses issue changes, so does your behavior. So, have you taken the time to reflect and assess your own set of personal habits and processes? Have you considered the cumulative effect on your employees of these external changes and its effect on their productivity, their effectiveness and your overall efficiency? I did, and reflect on my processes pretty regularly. It’s the bane of being a consultant, I need to understand and tinker with things in order to keep up to date and provide relevant information to solve client’s business problems. I always asked lots of questions, the biggest difference in my process happens to be the research process. In the past, I was a very avid reader of the New York Times and dutifully ventured to my front door half asleep to pick up the paper and begin scanning the headlines. Later I went to the Wall Street Journal and slowly opted to skip the chore of recycling the old newsprint, and read the headlines on my phone through the convenience of their respective apps, or use my desktop. The thing is, the biggest change? Neither one of these newspapers remains my #one information source or morning view. In fact, I stopped reading the New York Times entirely for a while, because as email habits led me to click open the inbox, other publications had more interesting headlines and their content became a more interesting set of sources. Better still, the minute I opt to share an article with a colleague, I’m no longer in email but a new application that the team chose to use less to keep our inbox clear, but to insure we were finding and able to keep and organize the messages. Naturally some of our remote global team members would notice I was online and would shout out to me via Google Chat. Those who were using the proprietary platform we built, would post and the site would automatically trigger an email notification to encourage other members to respond. I discovered that my own process, work habits and overall effectiveness ebbs and flows with the connected capabilities of the underlying platforms I find myself using. I’m not suggesting that having one is a good idea, but I also know that it’s valuable to impose some discipline and standards for the teams in which I work. It’s way too easy to be online, for example this post began as a voice transcription using my phone. The longer it got, the sooner I had to move to a bigger screen and so I jumped to my desktop to continue. Inevitably, there was a sync delay. Later, I had to reconcile the two versions on the two separate devices. I would welcome thoughts on if and when you personally, or your team revisits your work processes and to what extent efficiency or effectiveness plays a role. Please share, and if you would be willing to be part of larger research drop me a line. Supply chain software, and a minority stake at that, wrote Loretta Chao to WSJ readers made it clear that Nordstrom definitely is intent on preserving their advantages. As a retailer, they definitely get what digital business means–they are actively engaged in shifting distribution and inventory control, not merely adding data points to track, but redirecting their fulfillment. Yesterday, the Wall Street Journal also reported shifting focus by big mall developers, who have leveled the mall spots once anchored by top retailers to make room for a new wave of experience magnet attractions. Fewer and fewer people respond to traditional retailer marketing and sales cycles. Ron Johnson’s early insight that shoppers were ready for greater transparency was ineffectively translated and instead of turning JCPenny’s into a winner, he managed to accelerate its decline. The realization of end-to-end digital retailing has been slow to arrive. True to form, it has not materialized evenly. The latency, or the time interval that separates store buyers’ pre-order of seasonal merchandise, and its staged manufacture, delivery to warehouses and distribution centers before making it to the store created more than one headache for retailer. In a stable environment, where information was as limited as resources , retailers may have been better at holding customer’s captive and thus been more effective in their ability to forecast, price, track and sell in keeping with customer demand. The once innovation of a sale to prime the pump, by Ron Johnson’s time had become a fixture in the sales cycle. Was it really Amazon who introduced the idea of “Drop shipping?” No, as far as I know, Amazon merely managed to take advantage of Chris Anderson‘s description of Long tail distributions as it applies to supply and demand on the internet. Amazon’s platform that made it easier for interested buyers to find a supplier no matter how rare or plentiful the good. In other words, Amazon freed consumers from the restraints of retailers merchandising and elaborate distribution schemes. Drop Shipping Loretta Chao explains doesn’t merely reduce retailer’s inventory storage and management costs. Instead it enables retailers to reinvent their old process for securing product and putting it in the hands of consumers. This lets them compete directly with e-commerce players like Amazon and gain the same, if not greater advantage than Amazon’s platform provides. Personally, I’m just really excited about what else will emerge, and realizing that DropShipping is just one element of the changes that are here but just not evenly distributed. For example, remember why Kickstarter exists? On one hand it represents the unshackling of constraints forced by manufacturers who limited what designs made it to the mass market. New designers share their idea and get people to pre-pay and pre-order which makes it possible for more alternative goods making it into production. The presumption of scale still embedded into the calculations that the manufacturers would need a minimum order to make production worthwhile. Democratizing design is one thing, but imagine a non-inventory business model, one that puts goods in the hands of consumers faster with more control and choice.I recently heard a panel entitled Rethinking the Design Process at a thoght leader summit sponsored by soho house, Samsung and surface magazine, entitled Intersection 2016. Scott Wilson , original maker of MNML design, spoke with Charles Adler (founder of Kickstarter), Jesse Harrington , designer at Autodesk and Dean DiSimone , creator of Othr dedicated to minimizing the environmental footprint of remote manufacturing. If you have any other evidence of the shift, I’d love to hear about them. associations ..the dog that didn’t bark? We live in strange times, and life is strange. Obviously i was feeling a bit spunky…just looking at the word, makes me laugh. I share this as example of human to human conversations. There’s no chance that a cheeky chatbot would have written such a response. It’s why people are less predictable, making their every move less certain and the exciting part–capable of learning–both to be good or to be bad. Two, the dog that doesn’t bark? Shorthand for a famous turn of the phrase by Conan Doyle ascribed to Sherlock holmes seeking to solve a crime in which it was the absence of information that he cleverly used to solve the crime. (see the short story The Adventure of Silver Blaze). He collected the data, framed it in context to get information and then use the counterfactual to obtain the insight. What happened, what did you see or hear? When do dogs not bark? when they recognize someone they know, so obviously it was the trainer…. Three, Comment I noticed by Leda Glyptis who is now at Sapient…what a great bio! Extracting value from a wealth of structured and unstructured data, however, is not as much a technical problem, as a business problem. Technical heavy lifting will undeniably be needed to get you from having a ‘data lake’ to being a data-driven organisation but fundamentally: saying ‘there are 10,000 species of snake in the world’ is data; ‘there’s one under your seat’ is information; ‘it is asleep right now, so you can get up and walk away’ is actionable insight. I suppose, in highschool I first imagined being a writer, but I never committed.Adjusting Sensibility allows me the opportunity to practice, rehearse and communicate more effectively. This morning Bruce Kasanoff’s suggested “repetition is powerful, use it wisely.” It was a point I emphasized in my Goldilocks is a genius talk last week. After spending my weekend struggling to write, it also reminded me that practice always helps, but it’s not enough. Purpose matters, and the ability to see differences yourself that yields progress. I never learned grammar rules well. They annoyed me, they got in the way of my thinking aloud and desire to be creative, and imaginative in my writing. Today, I read a note aobut courage and another about It’s more likley that unconsciously I was insecure, less confident about everything. I did many things, and the easy stuff that came and most naturally, happened out of school in organizations and with people. Today, maybe there’s a university that grants degrees in leadership, especially since so many claim to be effective teaching the subject. Personally, I fought taking on the mantle and continue to enjoy being a collaborator. I now know that leadership terrifies me, becasue I beleive leaders need to be clear in their vision, confident in their situational assessment and unwavering in their commitment to their team and the mission. Several times I held project and team leadership responsibilities, I found myself sabotaged. My team didn’t challenge me or push back, it was my associates and peers in other roles or parts of the organization, and even at times my own boss.It wasn’t that they disagreed. More often it was the changes that the success of my intiaitve implied for them, changes they didn’t want to make, even if the changes actively improved the organization’s positioning. Now occassionally, they had better sight lines than I did. Just as often however they didn’t want to ponder the implications and preferred to shut down the intitiave, impede changesthat disrupted the smooth steady flow of their own projects. Professionally, and personally, I had been taught not to speak out of turn, and that it was best to find the right time and place to raise objections. In other words, a public meeting may not be the first time to challenge a colleague or a superior. Many people are surprised most by the passion and persistence that occassionally emerges when I do feel in command of my subject. It rouses and inspires them. Unfortuanately I don’t feel that consistently, so many who know me, see and experience something else. That voice needs confidence to speak, it needs purpose. I may love an idea but until I know what to do with it, then it’s just a vague notion. At present, in particular this post, I decided to share how using my voice in prose also helped me overcome confusion and reconcile inconsistencies in my thoughts and actions. Grammar annoyed me. It was a dull subject with seemingly annoying rules and my bad experiences stopped me from learning. I did well in school but not as well in English, becasue I never fully assimilated the basic lessons. Rather than learning how to improve, I got angry at all my mistakes and lost my confidence and along the way muffled my voice too. I recognized great writers by thir prose and persuasive narrative but never saw the effects of the underlying grammar unless, the author exaggerated it for affect. My inability to see these signs meant I didn’t try and work them out for myself until decades later. My writing remained less effective, less convincing and less committed. In contrast, my graduate professor in statistics challenged my lack of commitment to learning and excelling in her classs. I spent hours in the math library learning the notation to keep up with the matrix algebra that execeeded my formal math studies in basic calculus. I learned to feel the different effects that only practice produces. Likelihood tests and probability colors my thinking and establishes clarity that today I appreciate as akin to the effects of active prose. Our will, our intention and our purpose expresses the likelihood of our followthrough.My senior year in highschool I took an advanced literature course from an english teacher my oldest brother revered. I like to think she drummed out the word I from my prose. For decades, the pronoun One replaced I. Yes, it was gender neutral and I think that was its one saving grace. In additio to the distance it added to my voice, I no longer expressed my thoguhts or feelings but rather the thoughts, feelings or actions by those omnipresent, or omnicient–the ones. It’s fine to use third person. After all, this voice appears most most commonly in storytales. Goldilocks does, so do the bears, and so does Red Riding Hood, Hansel and Gretel every other character. What makes the story work for me is it’s use of active voice, that allows the reader to play along AS IF they too were that character. It’s in the active, direct prose that I now recognize but missed understanding and thus failed to practice. More directly, my present experiences and payment for writing made me up my game. It made me commit to learning and understanding. Let me correct that. The faith of the marketer who offered me the job, in fairness had seen some of my writing but he also demonstrated the value of great prose. After submitting a very hasty first draft long on creativity and very short on grammar, I got a single request. I had no idea what they meant,what I needed to change or where to begin. The last thing I needed to do was show my incompetence, so I turned to my colleagues of experienced writers to guide me. One buddy asked “what’s your process?” I couldn’t answer that questions which led to a series of additional questions on both sides. The more I didn’t know the sooner I realized the depth of my inexperience. The downside of blogging? It’s the absence of direct feedback that makes you a better writer. Conceptually I knew about thesis statements but had never consciously tried to use them in a cogent, organized fashion. Suddenly, years of prompts and suggestions made by lawyers and other active readers of my writring flooded back to me. My arguments were delayed, I had been a weak communicator becasue I overwhelemed the reader with detail and never disclosed my purpose clearly up front. After struggling mightily alone, a friendly call arrived just in time. Another friend and occassional collaborator offerd to coach me through. She held my hand, read my prose and succinctly pointed to examples of indirect reasoning and endless rationalization; that could be summarized in a short direct phrase. She helped me see how my sentences would benefit from better grammar practices. Her beautuiful quick examples used the active voice. Another lightbulb helped me see more clearly what I needed to do and how to do it too! Suddenly, I could see my poor grammar, my awkward phrasing, and my habits encircling a point and take the steps needed to correct them. Tighten became a directive for simplicity. I could see where I confused presenting a fact and thinking aloud. My readers didn’t benefit from learning my situation that led up to the analysis, they cared about the analysis. In closing, it’s easy to read good writing and it’s easy to understand too. If you know what you want to say, then you can write it, and you shouldn’t be shy about it either. If you don’t then whatever you write will waste yhour reader’s time. Blogs are fine for thinking out loud, exploring what you want to say. Do yourself and your readers a favor, before you hit publish, take your closing points and put them at the top. Then reread to be sure the prose you keep follows and supports that point. Aat the very least, maybe, like me, it will allow you the practice needed to improve your writing. Why else do you blog, if not to communicate your thinking more effectively? Are you looking for a recipe or a map? Problems are like Puzzles, both I think are well named, because there’s no implied process. No approach that everyone instinctively finds or consistently produces a quick result. Most common approach to problem solving suggests that it gets broken into smaller pieces. Why? Does a pattern emerge? Or, can you determine a relationship between the different pieces once separated? It sounds like a puzzle, doesn’t it? A jigsaw puzzle, it turns out defies this process. At an early stage of our process, after just a few attempts, we recognize that finding the edges first makes assembly of the puzzle easier. Rubrics cube, or its predecessor the four cubed puzzle–Instant Insanity, and its multi-dimensions add degrees of difficulty. The individual variation in the blocks make the solution difficult. Conceptually the puzzle’s solution includes deciding on the pattern to produce, and then setting the sequence in the cube face to match. Crossword puzzles, one of those things that people take great pride in their ability to be fast at completing. This type of puzzle is multi-layered patterns. One its’ the pattern of answer to match the clue, and there’s an insider advantage from practicing, the other is the words that fit the number of empty boxes, or has a particular letter in a particular place that allows it to leverage words it crosses. Now look at a map. It has edges that easily extend, if it’s a mobile dynamically linked map or not, or you know connects to a larger representation that’s known. In other words, maps help you see a larger reality in a glance. It expands your view of a landscape or a system. Maps and blueprints both lay out another perspective. We apply many rules to create and understand the representation. For example, scale, the ratio of an object’s drawn size to the object’s size in reality helps us visualize the inter-relationships of objects from a different perspective. One inch can represent a mile, or a thousand meters. Creating maps are more of a puzzle than reading them. The same is true about a recipe. If you know what you want to make, then a recipe provides the list of necessary ingredients and the instructions for assembly. It too incorporates a scale, so much of each ingredient when combined will create x number of servings. Most recipes scale easily you can increase the number of servings by apply the same factor to each ingredient. A recipe that serves 2, doubled now serves 4. Retaining the proportions of scale allows us to zoom in or zoom out to see more or less mapped details. Process, the method or approach that literally advances our thinking our understanding or activity turns out to be a bit of a puzzle. It’s exactly why framing a problem matters. As I learned last week, when asked to assemble into an 8×8 array 64 small tiles with white and black geometric patterns. There was one rule. Each edge of the tile must match the colors on its adjacent edge face. This was not a solitary task. My team effort comprised people who sat nearby but were strangers. We had 30 minutes. In addition, we were to estimate our progress at 15 minutes, and use the same estimation method at 30 if we were unable to complete the task. The objective was clear as day. Our team of six suggested that the task sufficiently resourced to tackle 64 pieces. The thirty minute timetable sounded reasonable. That was until we realized we had no methodology, no way to organize the six people and their skills, perspectives or background. We also lacked the means to identify what this particular challenge needed, and therefore we had no experience to assess the amount of time needed to complete the task. Brave and trusting souls that we were, we didn’t waste any time before everyone began to move pieces in front of them. Each of us set out to understand the task by doing. Quickly, suggestions began to spoken aloud. “We could assemble a small section, and then attempt to put the sections together.” Quickly, the group determined that approach too challenging. Instead, we opted to lay out one edge and build out the array. Well we didn’t finish in the 30 minutes. Did we fail? Not really, because each of us learned something new about process. More accurately, we paid attention to one aspect of process–one that generally we overlook, but proves essential to the solution. When breaking bigger challenges into smaller pieces, we don’t pay much attention to how those pieces once connected. These interfaces, or places and mechanisms that connect the pieces turn out to be essential to building on ideas, a recipe, a structure, a machine or even a city. “How” different or even the same things fit together isn’t straightforward. It definitely helps to have an objective. Highly specified objectives make the solution easier to recognize and more difficult to achieve. Loosely specified, sparsely details objectives generate a greater number of solutions and may create a new problem, selection. There’s an art to balancing the specificity of an objective and the skills and possibilities available. Each of us leans on our past experience and know-how to face new tasks and tackle new problems. For a new or unfamiliar task, we may find comfort in narrow specifications, easily achieved and successful solutions recognizable. Its part of why we often try what we know before trying something new. Thankfully, we also get bored with too much repetition. We enjoy variety but also willingly engage in many routine tasks to save ourselves time and energy. Accepting the trade-off of early or later specification changes the difficulty of the task and our ability to solve it efficiently and effectively. It’s what differentiates innovation from improvement, learning from reacting and leading from managing. Try it with different materials with your own team and discover more about your own internal how thinking and motivations. I encourage using play things—spaghetti and marshmallows with the instruction to build a tower, or small groupings of identical pieces like Lego that you invite everyone to build their own tower. Assign the open, but limited time task. Give people an opportunity to share what they did and engage a wider conversation about process dos and don’ts. It’s not just a great team building activity, it’s also great leadership and management development exercise. I’d love to hear back what you did and what happened as a result. Joe Fig, Jackson Pollock (2008) Copyright of the artist and Cristin Tierney Gallery. “There is an alchemy of delivering the right message to the right person”, Maurice Levy (CEO of Publicis) suggested in his recent Bloomberg interview about Business Innovation. Contrast Jackson Pollack’s Alchemy to anything you discover online. As the image above shows, Pollack’s aggressive style and posture shown above matches the work, and if like me, you had a visceral reaction to seeing it in person was that the message he had in mind? By contrast, the image shown online loses that quality, not because the photographic rendering was less than precise but because the online medium transformed our perceptions, placing it at a distance. In person, our clothes reflect our personal style as often as the default expression on our face. Think attitude and what if anything you do that distinguishes you when people meet you. Is it a small gesture that you actively put forward, or the less overt passive way you carry yourself that make people forget and fail to remember your name? When you want to impress others, how much do you know about the person you wish to impress and does it affect your preparations? Similarly, does the setting dictate and direct the choice of clothes, accessories, hygiene etc? The same questions, by the way, apply to your representation online. Professionally, it’s difficult to not have some online presence. A client, and well schooled friend whose PhD in sociology remains unaffiliated with an organization. He created an informal editing business for himself. He charges small sums to people who seek him out by reputation and word of mouth. In other words, his only clients are referrals from people with whom he worked before. Nothing wrong with organic growth, but he asked for my help to figure out how to scale what he did. His low level visibility online left me dumbfounded. That’s what prompted this post. I realize my strategy for online presence has not been well thought out too. I always considered PR to be a specialty and not something I needed to do for my business. Like my friend, I thought being me, would be enough, which is pure silliness or ego. Actions have always been the singular make or break of a reputation. If you don’t do as people expect, then that’s how you will be known–unpredictable, unreliable, or maybe unexpected. I enjoy being unexpected, that’s what my efforts in framestretching has always been about. The challenge, comes back to what Maurice Levy says, not every person seeks the unexpected. When you are hungry, or thirsty a great idea or a leaky water bottle that unexpectedly strands you is far from welcome. If there’s any trick to effectively communicating, it’s about understanding your audience, and establishing an even representation of yourself. Naturally, people learn to expect that things or people don’t change, what we see is what we believe is all there is, even if that representation appears unconventional. Professional demeanor proves recognizable when our profession dictates our actions consistently, even if the profession may be less conventional. The trick isn’t in how to be consistent, it’s in choosing what defines you. Once defined, committing to its use over time will slowly affect how others perceive you. The actions you take are not embodied in words, or the design of your logo–though they definitely impress many of us on some level. John Maeda, former Dean of Rhode Island School of Design, spends his time understanding differences between commerce, design and art, as well as the perceptions that make us differentiate so many things. In his work, he has helped people recognize that regardless of the content, perceptions often cloud the meaning of what we see, dictate how we will feel and decide what we sense. John Osborne, an artist did a take on Maeda by reshaping the written words in his book into a tree, and at the same time expressed making his own meaning and then reshaping it. Word of mouth is in fact the internal translation of what we know and then share with others about people. It’s how story became a conventional mode of transmission. As a little girl told me over the holidays, she recalled the questions I had asked her about Goldilocks a year earlier. The questions had made her stretch her frame of reference and think about possibilities that really stuck, which was my point and purpose. Her Dad, just grinned, after all he knows my reputation as a framestretcher and it thrilled him to see his 8-year-old thinking critically, considering the parts . So what representation do you want others to share, what stories can you help them tell better? Remember the expression built to last? It was an expression that my grandparents used to differntiate value. What I saw as an old tool, or piece of basic furniture or clothing they valued. The phrase also describes capabilities and inherent qualities that stand up, endure over time surviving changing conditions. The ups and downs of the stock market represent value differently. Analysts love to pounce on companies when they stumble. The bigger the company the better the blunder and the better for the Bears. Retail food and department stores currently appear to be under heavy fire these days, even brands and companies that dominated their industry. So what value should you seek? Investors seek returns but don’t always consider the long term costs, do they? Does sustainability really matter? I suspect some of these thoughts led Jim Collins and Jerry Porras to title their 1994 book Built to Last (BTL). Sure they may have thought to follow the example and success path set by Tom Peters and Robert Waterman whose titled 1982 research project In search of Excellence also became a best seller. In other words, the fundamentals that stand the test of time more likely due to discipline or luck. Sorry that it’s not the five that Collins and Porras research efforts describe. So why did Jennifer Reingold and Ryan Underwood in their Fast Company retrospective review of this highly influential business book try to salvage its essence? For the same reason that these books continue to inspire and continue to be best sellers. The Fast Company authors looked beyond the company profiles and focused on the stated principles. As pointed out earlier, Collins and Porras in later editions had to qualify their original findings in the preface. Collins’ later writing also back pedals with post mortems describing how his BTL companies had lost their way. I’m not the first to question the relevance of the principles to demonstrate the thesis of the book. In fact Collins was well aware of the criticisms leveled at Peters research, and why they adopted matched pair design for their own research. What bothers me is how story telling hijacked the writers’ judgment. For example, why use distinctive new prose when citing the principles? The better to make believers and best sellers, that’s why. It’s in these language choices that I begin to feel the book tilt. BHAGs conjure really ugly images. Who, other than a hero, would dare to take on something ugly? Personally, my criticisms side with Reingold and Underwood. Even by 2004, the BTL principles seemed less relevant in the face of massive consolidation, global outsourcing or even disruption that shifted the business environment. But the descriptive principles they coined failed to capture the essence of deeper qualities that underlay any organizations success, ones my grandparents would recognize. I’m talking about people believing in people. Recently, I attended a local meeting of the Private Directors Association. I heard a panel of three CEOS talk about their 100 year old companies. At the close, each of the CEOs identified factors they thought helped them survive. Profitability never made their list, nor did any pithy phrases tumble from their lips. The single repeated understanding described their commitment to people and values. Not only have these companies experienced low employee turnover over the life of the company, they shared unusual views about proper compensation and invested heavily in training. For two of the three, visible diversity on their boards had been a conscious decision in the most recent period. Another notable common thread described their recognition of business value–that goods and services they offered should always exceed the price customers paid. Pride of ownership too dominated and was demonstrably evident in each of these companies successes though Mead&Hunt now employee owned and operated, and the other two remain family owned and operated. Each and every company pointed out their expectation of modest returns and willing attitudes toward change and adaptation. In other words, missing from the conversation was the idea that any of them expected to use the business as a vehicle for generating great wealth. A friend pointed out that mid-market company values, at least evident in the mid-west, don’t seem to match those of corporate America. I wouldn’t go that far. Particularly since these companies were all privately owned, its difficult to measure them using the criteria that BTL employed– 10x returns on stock price. Not a one would be considered leaders in their industry. Even Mead & Hunt which is employee owned understands that returns on their own capital rely directly on production and interaction with customers and not financial shell games. Had to laugh at that. Continuous transformation or a transitional approach, which path do you prefer? Wow, lot’s of room in those statements. Both US Stocks and bonds slipped following her remarks. It’s become commonplace to link Fed Chairpersons’ remarks to the rise and fall of the markets. I’m not so willing. Maybe because my thoughts of late were influenced by a conversation hosted by the Becker Friedman Institute I attended last week. Entitled The Role and Impact of Monetary Policy in an Uncertain Economy and included Charles Plosser of the Philadelphia Federal Reserve and nobel laureate Lars Peter Hansen. I know with certainty the relationship between the gas pedal and the degree of pressure applied by my foot and the acceleration of my car. Janet Yellen and the Fed no matter how experienced and accurate the input data, the econometric models relationship to the economy remain uncertain. It’s why changes in pressure they apply to expand or contract interest rates have a fuzzier relationship to the economy, and the measurable results more complicated and less consistently understood when compared to my car’s observed speed when I hit the or lighten up on the gas. Modeled certainty when it fails produces uncertainty but doesn’t mean stop, or does it? I only watch the dashboard in my car. I used to have a ticker list of stocks I followed, but no more. I also rely on the weather app on my phone even though it’s not very accurate. Why? Well it’s useful to be prepared for forecasted conditions, even though several are beyond my control. Yes the weather is uncertain inspite of models who do their best to assure us. I’m not alone in my struggle to understand and interpret the signals around us, especially the indicators of the health of the American economy and the global economy. For one, its more complicated than the working of my car, which I also don’t fully understand. The dashboard guides me, it reminds me that the gas tank needs refilling or that in a particular area I may need to reduce my speed, or if the other lights go on I should get a mechanic to take a look. Today the growing interconnections between sensors, and communications technology make makes it possible to funnel more information to me in real time than ever before. So, what value do additional indicator really offer? What does knowing more change? The answer is it changes everything, but not necessarily in a predictable way. Experience, does affect how we process information. Our brain uses experience to filter out commonplace or the “usual” details in our midst. Organizationally, experience used to model and plan the allocation of resources and assure us with forecasts based on different decisions. The bigger the organization, the more careful and challenging the coordination and planning activities. When I was a kid, I heard the expression “As goes General Motors, so goes the country.” I didn’t know the first thing about economic indicators, or inflation rates. My family bought GM cars, so when my grandpa bought a new Buick, things were going well. Conversely, things were going less well when my father continued to drive his Pontiac long after a small hole in the floor board appeared spurting water when we’d hit a puddle. drew foreign direct investment (FDI) currently valued at $74 billion—approximately 3 percent of all FDI in the United States. And collective investments of almost $46 billion that expanded and retooled U.S.‐based facilities since 2010. It take a reasonably long time to build a car, but people don’t buy them very often, so supply can generally keep up with demand. If we use GM as a litmus test for the economy there’s some wise and prudent parallels becasue there’s a lot of interdependencies between larger sentiments and people’s financial capabilities. 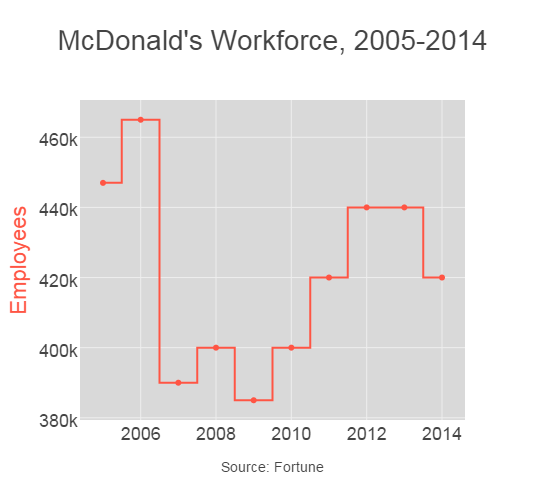 In contrast, fast food offers a set of alternative indicators to measure the pulse of the economy. In May of 2015, US news speculated about the inverse relationship between the two in an article entitled “McDonald’s earnings slide could be a function of economics. Besides, McDonald’s is the 2nd largest employer in the country, trailing WalMart. Not surprising given its 14,300 restaurants –4.6 outlets per county. (I plan to explore this idea more fully in a post I’ve drafted called McDonald’s a truly American Story). I only point to these two companies becasue I think it’s important to notice the difference between government actions and companies responses to changes in external conditions. “To compound matters, the diversity of the business environments—in terms of growth, rate of change, and harshness—that global companies face is expanding in a multispeed world. So it is not surprising that many companies find their strategies and business models increasingly out of step with their environments. Is that what you want the Federal Reserve Governors to do? I hope not. It’s why I don’t envy them nor am I ready to second guess them. In reality no one should let uncertainty about monetary policy and interest rate hikes hold up your planning, I would encourage you to take a harder look at the relationship between the micro as well as the macro trends in your industry. You don’t need a data scientist per se to create an elaborate model, but it can’t hurt. The trick is to merely face the realities. Try to imagine how your customers adjust and see if these factors are included in your own models, you might fill in a few more gaps..a sustainable path is up to you. Are you wired for growth? I wanted to call this post, switched on growth, but that didn’t fully capture the emerging idea in my head. Upon waking I found myself wondering about two very different idea. What makes flowers in chicago bloom in November and why the internet never seem to run out of capacity? Since its not uncommon for my ideas to make sense to me but sound to others as if I’m hovering in the clouds at 30,000 feet, allow me to explain. We distinguish two types of changes –transitional and transformational. I doubt caterpillars or tadpoles in their initial state can do anything that prepares them for their existence post their transformation into butterfilies and frogs? People in the course of their development do. We have an uncanny ability to remember past experiences and in many cases it forms our thinking about the future. In other words, if we set our minds to it we can imagine our future in ways that I suspect is impossible for tadpoles and caterpillars. Seeds don’t imagine flowering, instead they are merely wired for growth. Something switches on when they find themselves in the right environment and as long as the conditions persist to sustain that signal they keep on growing. Research into human development when combined with the neuroscientists understanding of our brain’s growth reveals that humans bear a similarity to seeds. From the conception moment, as long as the environmental conditions prove favorable, we manage to grow inside the womb, and then we do go through our own transformation as we emerge into the wider world at our birth. Our sensititity and early instincts begin to form long before we experience our first breath of fresh air. The different parts that we call the human brain just as the different body parts that comprise our stature do have limits. The internal instructions of DNA and RNA have some latitutde which is why environmental conditions do have an impact. But it’s the same underlying code that turns some seeds eggs into tadpoles and some into humans. The biggest advantage humans have over all other creatures and life forms seems to be their ability to alter their environment. In other words, we can modify and then optimize the conditions in which we can thrive. Social tools like communicaions and today’s more advanced incarnations realized through a combination of hardware and software offer amazing opportunities. The motivation to transform our surroundings not unique to humans, as evident in nesting behaviors. Birds have been observed building rather elaborate nests, as do other creatures establishing protective and cozy environments that protect their young. Likewise learning or mimicry has been observed in the animal kingdom, and even to some degree plants who move with the sun. The more distinctive qualities of humanity, such as fashioning materials with our hands has evolved to a much greater degree than in other animals. Unlike other animals, our internal wiring as refashioned and transformed our brain to be capable of a variety of higher functions one of which is manifest by this post. The abilit to formulate ideas, conceive of connections without seeing them and then describing them in a manner thtat others can understand now or at some point in the future? That’s pretty different from the tricks my favorite dog and plants can manage. Transitions the ability to adjust and assimilate new information depends on prior experience. I’ve never met anyone who can remember their life in the womb, but again researchers studying human development know among all of our senses, vision is the last to develop. In fact it takes babies months before their eyes can hold focus while shifting their line of sight between objects near and far. I mention sight becasue it’s an easy transition to understand. Who hasn’t crossed a threshold and found themselves momentarily blind by the extreme difference in light levels. It takes a few moments before your eyes acclimate, doesn’t it? Transformations, as we described above are a wholly different experience. Imagine walking only to find the next step plunges you into a deep hole filled with water? your body responds in even less time than your eyes take to adjust. If however you were on the edge of the water and had maken a conscious choice to go for a swim, your body knows exactly what to do. Again no transition or acclimation to the needed unless of course you want to open your eyes underwater. Differentiating between conditions that require transitions and permit instant transformation is what I beleive separates an agile and flexible organization ever ready to grow. Both benefit from planning but their response time to change varies dramatically. If your organization desires to remain competitive learning and building the right capabilities and capacities matter. I believe that like the human brain, an organization needs a flexible responsive platform to coordinate and integrate the exchange of signals. Why a platform? Simple answer is humans are only good at keeping in mind about two or three thoughts at once, the platform like the really capable personal assistant can track and pop up the right messages at the right time. No, I don’t mean Siri. Why? becasue Siri may be able to talk to my calendar and figure out much of my personal peculiar turns of phrase and short hand names for things I need and use regularly. Siri doesn’t yet fully take advantage of signals other than location, or the fixed notations. Siri may help me, but I haven’t seen the enterprise version, have you? When you do, let me know I’ve got several assignments for her. I’m betting you do too.